We are continuing to bring some holiday cheer with our friends at Stampendous on Day 2! Check out both design teams as they share their take on some holiday festivities through their projects during the blog hop week. Dana Tatar and Yvonne van de Grijp will share theirs today. Dana Tatar decorated a wood birdhouse for the Winter holiday season. She created her own layered bird embellishments using a combination of stamps and dies, embossing powder from Stampendous, along with 3D Foam Circles. Dana shares her tutorial for this delightful ornament, her tips for using Creative Photo Corners for shingles, and her favorite way to add frosty accents. Visit her blog. After stamping the Seated Elf Cling Stamps and Dies Set images on smooth white cardstock with a soft grey ink, I colored with color pencils and die-cut the images. To make the packages sparkle, I adhered Adhesive Dots Mini and Adhesive Dots Medium its circle designs by sprinkling Jewel Glitter on top of the Adhesive Dots (after removing the liner). Tap off excess to Wear Your Adhesive on the Outside! I assembled my card using the E-Z Runner® Grand Refillable Dispenser. Stamp the sentiment on the white panel with black ink. The colored image adhered with a combination of Thin 3D Foam Squares White Mix and 3D Foam Squares White Mix for a variety of dimension! Lastly, create glittered snowflakes by adhering Adhesive Dots Mini and Adhesive Dots Micro to the white card panel, remove the liner and sprinkle Crystal Glitter on top. Take a look at the other days too! For Day 1, CLICK: Holiday Card Creations with Stampendous – Day 1. Day 3, CLICK: Joyful Inspiration from Stampendous – Day 3. For Day 4, CLICK: Card Making Merriment with Stampendous – Day 4. 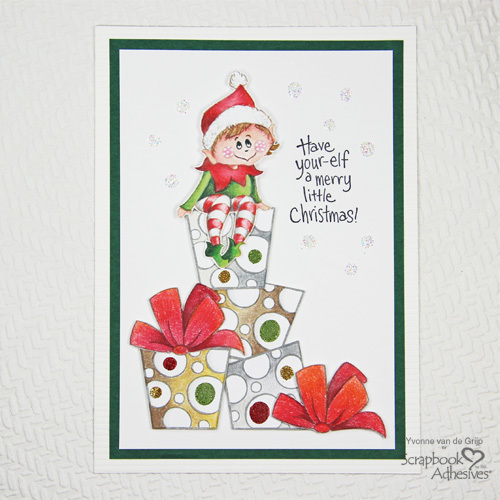 Day 5, CLICK: Holiday Fun with Stampendous – Day 5. 2018 Holiday Blog Hop with Stampendous – Day 2. To enter to win click through the Rafflecopter App. Winners will be randomly picked. Entries from the U.S. and its territories are welcome. If you cannot see the comment section (at the bottom of this post), please CLICK: Holiday Cheer with Stampendous – Day 2 and scroll down to the bottom of the post. Connect and Stick with 3L! Visit our Website and Bookmark our Blog! This entry was posted in 3D Foam Circles, Adhesive Dots & Lines, Adhesives, Altered Art, Announcement, Cards, Crafts & Tutorials, Crafty Foam Tape, Creative Photo Corners, Gifts, HomeHobby by 3L, Intermediate, Other Adhesives, Permanent Adhesive, Seasonal Craft Ideas, Skill Level, Tutorial, Wear your Adhesive on the Outside, Winter and tagged 3D Foam Circles White Mix, 3D Foam Squares Mix White, 3D Foam Squares Regular White, 3D Foam Squares Small White, Adhesive Dots Large, Adhesive Dots Medium, Adhesive Dots Micro, Adhesive Dots Mini, Blog Hop, Card, Card Making, Christmas, Crafty Foam Tape White, Creative Photo Corners Black, Creative Photo Corners Mix Pack, Dana Tatar, Dual Tip Glue Pen, E-Z Runner Grand Dispenser, E-Z Runner Grand Permanent Strips Refill, Gift, Giveaway, Holiday, Home Decor, HomeHobby by 3L, Ornament, Stampendous, Thin 3D Foam Squares White, Wear Your Adhesive on the Outside, Yvonne van de Grijp. Bookmark the permalink. 29 Responses to "Holiday Cheer with Stampendous – Day 2"
Adorable. Love the elf sitting on the presents, what a great card. Such an adorable bird house and card.The elf is so cute sitting on the presents. Cute projects. 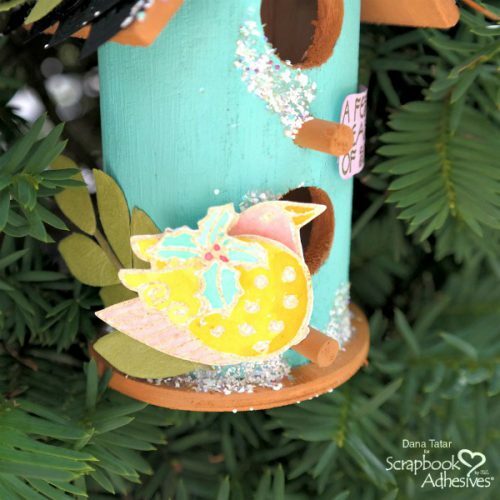 Love the layered bird embellishments for the bird house. Dana and Yvonne did such beautiful and creative work to inspire us for the holidays! 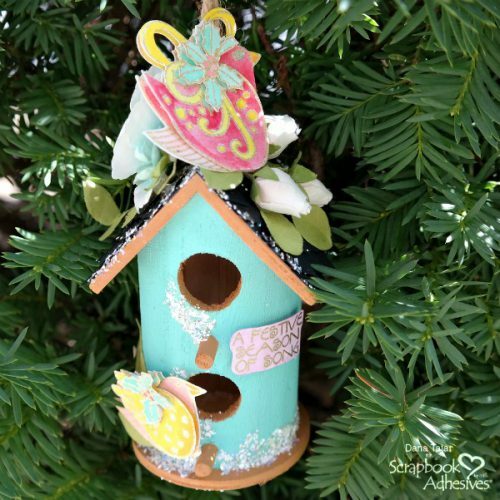 Dana’s adorable 3D watercolored birds on this fabulous little birdhouse ornament in such bright and fun colors is a showstopper! Yvonne’s elf on a shelf slash gorgeous packages is stunning with the glitter dots and adorableness of the elf! Love both of their beautiful projects! Such a fun idea with the birdhouse! 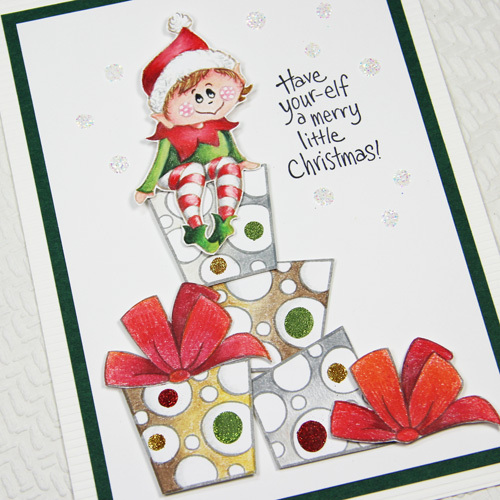 Love the elf card….so cute! Love the bird house and elf card! Great holiday projects! The birdhouse is simply awesome! Love the roof shingles made from photo corners. Really creative. And the elf card … so adorable and precious. Wow, what amazing projects! The birdhouse is adorable, so many fantastic details. The card is so sweet and crisply executed. Love the elf card, so refreshing and joyous lookig.. just so cute. Love the little bird house. some small ones that I have. Super cute card and the birdhouse is ADORABLE! Adorable decorated bird house and cute elf card! Loving both projects!! I’m intrigued by the mini adhesive dots. So many uses for these. Great projects girls!! WOW today’s projects are beautiful and fabulous. 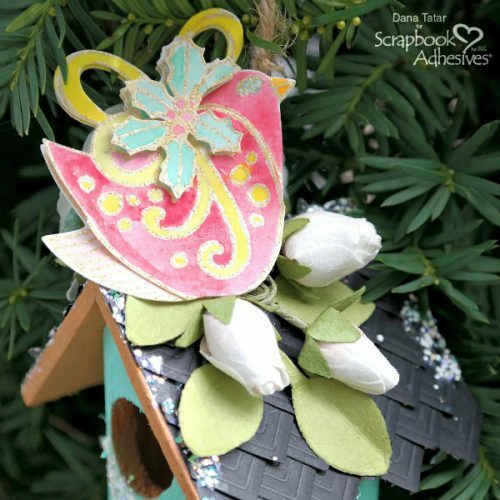 The birdhouse is a fun project and love the very cute elf card! The elf is just sooo cute. That birdhouse is amazing! I love the shingles made from the photo squares. That’s such a creative use for them. All of the glitter and sparkle really does give the look of a cold winter day. The adhesive dots have been used so creatively on the elf card and the bird house project is fantastic.